Lemon Jelly (formed in 1998) are a British electronica duo from London, UK consisting of Nick Franglen and Fred Deakin. Franglen and Deakin initially released three limited-circulation EPs, The Bath (1998), The Yellow (1999), and The Midnight (2000), which were then collected into a widely-released album in 2000, lemonjelly.ky, which was both a critical and a commercial success. Their second album (and self-proclaimed first studio album), Lost Horizons, was released in 2002, and was another success. Franglen and Deakin initially released three limited-circulation EPs, The Bath (1998), The Yellow (1999), and The Midnight (2000), which were then collected into a widely-released album in 2000, lemonjelly.ky, which was both a critical and a commercial success. Their second album (and self-proclaimed first studio album), Lost Horizons, was released in 2002, and was another success. Their last album, 2005's '64-'95, featured a sticker to warn listeners that "This is our new album. It's not like our old album." The title comes from the fact that each track features a single sample drawn from years between 1964 and 1995, incorporating each sample in a variety of imaginative ways. They have also made mix sets for Radio 1's Mary-Anne Hobbs' 'Breezeblock' show, as well as for a variety of other shows (6 Mix, XFM's 'The Hijack', The Blue Room, etc). They have remixed a number of other artists, including Badly Drawn Boy, Pet Shop Boys and Coldcut, as well as collaborating with William Shatner on a track from his latest album. 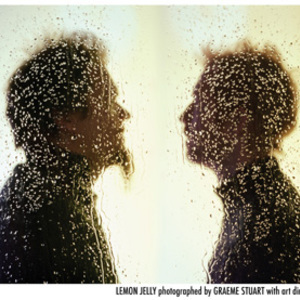 In January 2008, the duo announced Lemon Jelly would be breaking up for the foreseeable future. Fred Deakin released the news on their forum. He also stated that whilst there was a possibility the two would work together again, they would be pursuing solo careers for the time being.